Microstrategy is a very broad, and very deep business intelligence platform. It will primarily be of interest to large corporations with complex requirements, and a very large body of users who need reports and dashboards. While it does address the current vogue for all things visual, it is not as proficient, or easy to use, as products such as Qlik and Tableau. It does however go well beyond the remit of platforms such as these, with integrated advanced analytics for scoring, and industrial strength production reporting capabilities. By Microstrategy’s own admission, users are still uncovering capability after a decade of use. The main complaint heard is that of the high price. Microstrategy comes in various ‘modules’, and if an organization wants the whole set, it can turn out to be pretty expensive. But there is a value for money argument to be made here, since the high price is rewarded with almost unlimited sophistication. The platform is an integrated whole – not a trivial accomplishment for so large a product. Developers delight in the object oriented architecture, which often has the pleasant effect of increasing productivity as the sophistication of a deployment increases. The user interface is primarily browser based, with various well defined layers in the architecture below this. Unless your business is as large or as complex as General Motors or Exxon it may be overkill, and some of the more visual oriented products might be more suitable. Although Microstrategy does offer sophisticated visual analytics in its portfolio of capabilities. The most recent release is Microstrategy 10 Secure Enterprise – with an obvious focus on security. This is an essential feature when enterprise wide, highly distributed intelligence is being employed. It ties in with Microstrategy Usher – a device based security protocol deployed on mobile devices – and the Apple Watch. In summary, Microstrategy is a good choice for large organizations with sophisticated needs, pursuing a one product does all approach. The other approach is best-of-breed, with the advantage of a better fit, but at the cost of managing disparate platforms. This is a broad reach, and is only possible because the product architecture was purposely built to support them. An integrated backplane provides a set of common services, including metadata, prompt generation, scheduling, in-memory data, shared caching, security, user management, query generation, and administration. The core engine supports each style of BI as a service module. These can be added as needed, but as mentioned previously it can become quite expensive. A unified web interface means all functionality is delivered through a single facility – and often through the web browser. It means everything in Microstrategy has the same look and feel, and interfaces such as enterprise portals and Microsoft Office can be used via web services. The dominant Microstrategy user interface is browser based. It’s an obvious choice when thousands of users might be accessing reports and dashboards. It means client software does not have to be installed, and the clients can be fairly lightweight. IT also does not present the headache of trying to ensure that client software is updated when changes occur. This functionality extends to mobile devices, and Office applications can access Microstrategy objects via web services. This is a free Windows desktop platform, quite capable of advanced analytics, but primarily aimed at self-service analytics needs. It directly competes with some of the simpler to use visualization tools such as Tableau, and features the same in-memory database for fast processing. It provides a R integration for more sophisticated forms of analytics, and pretty much does the things that modern data visualization tools do – for free! The decision to create a consistent web interface for all users turns out to be the ideal scenario for the cloud deployment of Microstrategy. It means that exactly the same functionality can be delivered, with absolutely no exceptions at all. The dashboards, reports, visual analytics, advanced analytics and mobile apps all look the same, and there is absolutely no reason why they shouldn’t. Provided the relevant modules have been obtained, Microstrategy provides good all-round advanced analytics capability. This extends to data mining and statistics in the main, but a large number of functions are also included. The data mining capability is fairly good, and the user interface easy-to-use. There are dangers associated with such ease-of-use in this domain, but Microstrategy does issue a health warning. Decision tree, clustering, logistic regression and several other well known data mining methods are available via a wizard type interface. Other types of data mining such as neural networks and support vector machines can also be imported (via PMML), and integration with R means that pretty well anything is possible. Data mining and statistics enhance the value of business intelligence applications by adding scoring functionality. So when a call center operative brings up details of a customer there may be a credit scoring, or maybe various products are scored as being suitable for an up sell. Microstrategy is one of only a few platforms that supports this type of functionality in an integrated environment. Microstrategy Intelligence Server – this effectively handles data and metadata processing. It creates optimized, multi-pass SQL queries for relational databases, HiveQL for Hadoop and MDX for multidimensional sources. Having retrieved data it then passes the resulting report to users via mobile, desktop, Office or the distribution services. Microstrategy was using in-memory cubes before much of the competition existed, and so it knows how to scale to hundreds and thousands of concurrent users. It also manages much of the admin – users, security, data security and access rights. Intelligence Server can be clustered with fault tolerance and failover features. It truly is the heart of the product architecture. Microstrategy Web provides all functionality through a web browser. There is no preference for a fat client stand alone desktop (although such a product is available). 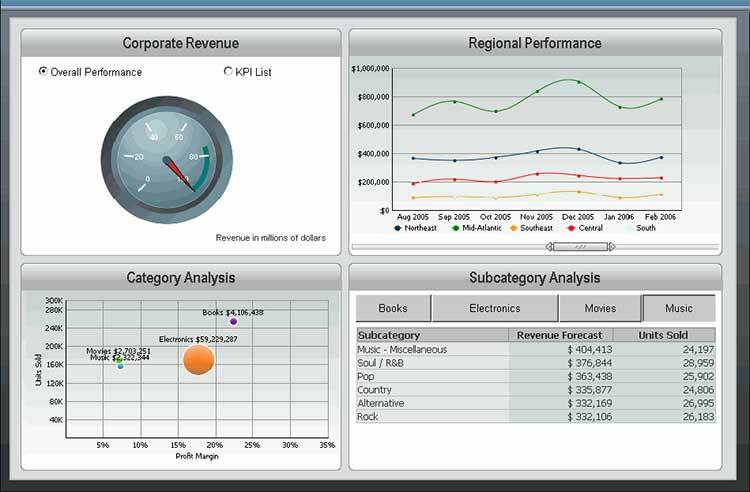 Microstrategy Report Services – for high quality reporting, dashboards, visual analytics and report design. I’ll avoid the term ‘pixel perfect’ since it really means very little, but Microstrategy is capable of producing reports with exact formatting and delivery to almost any device. Microstrategy OLAP Services is an extension to Intelligence Server that adds in-memory processing to the standard ROLAP functionality. It creates and manages Intelligent Cubes, and exposes report objects in the intelligent cube so they can be manipulated by users. Drill down performance is greatly enhanced, and the cubes are used whenever possible in preference to direct data warehouse access. Microstrategy Transaction Services provides write-back capabilities from Report Services documents. This is often used with mobile apps, allowing write-back to ERP and other systems via web services. It supports update, insert and delete operations. Microstrategy Distribution Services distributes personalized reports and alerts. It does this through interactive Flash dashboards, and static reports through email, folders or printers. Reports can be distributed based on a regular schedule, events such as database updates, or triggers such as metrics that are outside a threshold. Microstrategy Office delivers Microstrategy objects to Microsoft Excel, PowerPoint and Word using web services. Documents are refreshed as needed and Office becomes a repository for various document types. Microstrategy Desktop is a Windows fat-client that provides advanced development and analysis capabilities. Microstrategy Architect maps the physical data sources to logical business objects. It provides a graphical interface, and resulting logical models make report production more efficient and speedy. A number of ‘starter’ applications are provided for major business functions (e.g. financial reporting and sales analysis). Microstrategy MultiSource Option extends the Intelligence Server, and facilitates unified access to a large number of data sources. Microstrategy Clustering Option supports multiple instances of Intelligence Server to act as a single logical system. It extends availability and performance. Microstrategy Object Manager is a change management tool that manages the application development lifecycle by assessing the impact of changes to the application, and migrating these changes across development, testing, and production environments. In short, MicroStrategy Object Manager makes change management accurate, fast and efficient. Microstrategy Integrity Manager automates the detection of inconsistencies and errors so that business users can rely on the accuracy of their information. It compares each dashboard or report, comparing its data, SQL, graph, Excel, PDF output and execution times. This saves the time needed to manually generate and compare report output. Microstrategy Enterprise Manager enables analysis of resource utilization, project performance, user statistics, and trends to facilitate performance tuning and resource planning of a MicroStrategy business intelligence implementation. Enterprise Manager is a packaged data warehouse containing historical analysis of MicroStrategy operating statistics, a data-load process that transforms the operating statistics to the data warehouse, and a MicroStrategy project built on top of the data warehouse. MicroStrategy Command Manager enables script-based administration and maintenance of objects, security, and system configuration for large user communities using textual commands. These commands can be compiled into script files and run from a graphical interface, through a command line editor, or directly from the command line. The script files can be scheduled through operating system utilities or integrated into 3rd-party Systems Management Software, automating repetitive maintenance tasks. Obviously this is a very broad capability, and will be appreciated by large businesses with demanding requirements. It is probably easier to say Microstrategy will handle any data a user throws at it, than list all the methods, architecture and sources it can handle. In summary these include most relational databases, data warehouses, multi-dimensional sources (SAP BW, Hyperion etc), web services and XML sources, Salesforce, Hadoop DFS and Excel files. Users can import directly into Microstrategy Cubes, without any assistance from IT, for dashboards, graphs, grids and so on. It should be clear by now that Microstrategy is extremely sophisticated when it comes to governing and managing the business intelligence environment. It is also extensible and supports powerful mechanisms for embedding business intelligence applications into production applications. In some respects Microstrategy stands alone, since its BI offering is not part of a broader solution, as with IBM, Oracle and SAP, and at the same time it does not really compare with products such as Qlik, Spotfire and Tableau. It is much more production BI oriented than these latter products, and not quite so adept at the visual analytics. Some of the larger cloud based BI suites, such as that provided by Birst could be seen as an alternative, but Birst certainly does not provide the sophisticated architecture of Microstrategy. Microstrategy has been around over two and half decades. In 1996 it totally re-engineered the architecture of the product in anticipation of future needs. It was a good move, although viewed as somewhat risky at the time. Today it provides an integrated, extensible, highly governed business intelligence platform that can scale to meet the most demanding of needs. The basic trade off with Microstrategy is this. It will do pretty much anything a large organization might need – but at a cost. And this cost can be measured in terms of money, and the skills necessary to extract value. Ultimately it depends on the needs and attitude of the users. If a deep and broad BI capability is needed, and the price acceptable, then Microstrategy is a good way to go.